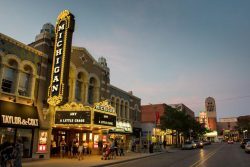 Ann Arbor, a college town full of a growing community of students, foodies, and adventure-seekers alike. A person from Ann Arbor is called an “Ann Arborite”, and many long-time residents call themselves “townies”. The city itself is often called “A²” (“A-squared”) or “A2” (“A two”) or “AA”, “The Deuce” (mainly by Chicagoans), and “Tree Town.” Ann Arbor is a major scene of college sports, most notably at the University of Michigan, home of the Wolverines, a member of the Big Ten Conference. Several well-known college sports facilities exist in the city, including the University of Michigan Football Stadium, also known as ‘The Big House’ the largest American football stadium in the world. Several performing arts groups and facilities are on the University of Michigan’s campus, as are museums dedicated to art, archeology, and natural history and sciences. Another unique piece of artistic expression in Ann Arbor is the Fairy Doors. These small portals are examples of installation art that can be found throughout the downtown area. Ann Arbor boasts access to the beautiful scenery of the Nichols Arboretum and Huron River and a wide range of restaurants and bars inspired by the city’s growing food revolution. Aside from a large restaurant scene in the Main Street, South State Street, and South University Avenue areas, Ann Arbor ranks first among U.S. cities in the number of booksellers and books sold per capita. Howl2GO by Howl at the Moon is the premier name in Dueling Piano entertainment. Bring our incredible performance to your event in Ann Arbor at any venue. 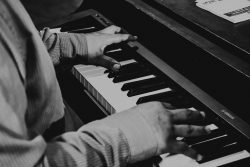 When you bring Howl2GO to Ann Arbor, you can be certain you’re getting the true Howl at the Moon experience, and with that comes the assurance you are booking only the best dueling piano performers in the country. Our fun, energetic performers are perfect for all events anywhere in the Ann Arbor area. We specialize in all types of events, anywhere in the Ann Arbor area – company parties, wedding receptions, charity fundraisers or house parties are all made more fun by bringing Howl2GO by Howl at the Moon. We tailor every single show to you and your guests, playing music for all ages. Fundraising for churches, schools or your chosen cause is perfect for our show – plus advertising that you have Howl at the Moon performing is a huge draw in the Ann Arbor community. Dueling Pianos in Ann Arbor is all we do! Howl2GO has a dedicated team of professionals on staff. From our sales manager who will help build out your vision, our production team who will communicate with your venue in Ann Arbor, a wedding specialist and, of course, our world-class entertainers, picked specifically for your event. We only bring Howl at the Moon trained musicians, all of whom have experience playing at one of our locations nationwide. We are a perfect choice for your wedding – we keep numerous couples in Ann Arbor and their guests dancing all night, as well as taking care of all your ceremony, announcements and special family dance needs. Don’t risk booking a local fly-by-night company that may not even still be in business when your wedding date comes around, nor one that hires freelance players. Howl at the Moon has been rocking since 1990 and our reputation precedes us. Visit our new website: www.howl2go.com for booking information or call us directly on (844) HOWL2GO. We have a dedicated reviews page so you can read testimonials from hundreds of our thrilled clients in Ann Arbor. Our Facebook page features regular updates, and following us on Instagram and Twitter means you’ll stay up to date on where we’re playing next near Ann Arbor.